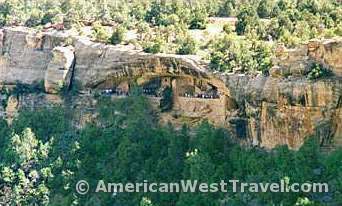 Mesa Verde National Park was the first national park designated for its cultural resources. 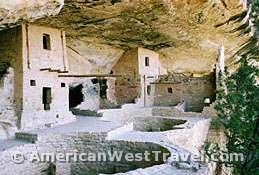 It preserves an area occupied by the Ancestral Pueblo (Anasazi) people from the 6th through 13th centuries, and is world renowned for its amazing cliff dwellings. 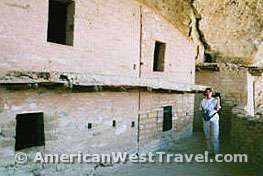 The reasons (such as protection) why the pueblo people chose to live in cliffs during the last half of the 13th century can never be known for certain, and has always been a topic for lively debate. Balcony House (right) may be visited only by a ranger-led tour. 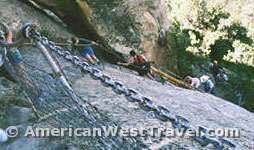 This adventuresome tour allows the visitor to experience a taste of what the orginal inhabitants experienced in that access and egress is accomplished by ladders and stone steps carved into the cliff. Also, it is one of the few places where a dwelling has a preserved balcony. Access (left) to Balcony House is by a 32 foot ladder at the right end of the dwelling. 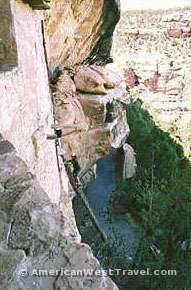 Exiting the ruin (above) is to the left, crawling behind the huge boulder (see picture at top) then climbing 60 feet up the cliff face on steps carved into the cliff and finally another ladder near the top. The tour is not for those who fear heights or tight places. Also, the high elevation (about 8,000 feet) makes the climbing somewhat strenuous. Balcony House is named for the remnants of a balcony on this building. Structures such as this balcony as well as roofs and upper floors were generally built with thin logs and branches covered by adobe. They deteriorated much more quickly than brick walls and are therefore rarely seen today. The round objects in front of the buildings are remnants of kivas. They are chambers about eight feet deep and were originally covered over with an opening in the center for access. Kivas were thought to be community gathering places for religious ceremonies. An indispensable guide to archaeological ruins of the American Southwest. Why did such a great society collapse? Who survived? Why? In this lively book anthropologist/archaeologist David Stuart presents answers to these questions that offer useful lessons to modern societies. Exotic scenery from the world's most photogenic slot canyon. After vacating the Colorado Plateau, the ancient Anasazi and their descendants have flourished in New Mexico for centuries. The state is also rich in the history of the Spanish Conquistadors. Most fascinating are the places where the two cultures intermingled and clashed. Mesa Verde National Park is on US-160 in southwest Colorado between Durango and Cortez.